Make the crust: Preheat oven to 350°F/180°C. Wrap the outside of a 9-inch springform pan (bottom and sides) with a large piece of foil, then repeat with another piece. This will ensure that water from the bath doesn’t seep into the cake. In a medium bowl, mix together crumbs, sugar, cinnamon and ginger until combined. Add melted butter and mix until combined and moistened. Press mixture into the bottom of prepared pan to form an even layer of crumbs. Bake for 8-9 minutes until golden brown. Allow to cool completely on a wire rack. Meanwhile, prepare the filling. Reduce oven temperature to 325°F/160°C. Make the filling: In a mixer fitted with the paddle attachment, beat cream cheese on medium-low speed until smooth and lump-free, 1-2 minutes. Add granulated sugar and brown sugar and beat until blended. Scrape down the sides and bottom of the bowl as necessary. Add cornstarch and mix until blended. Add the eggs and beat until fully combined. 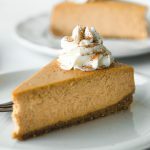 In a medium bowl whisk pumpkin puree, heavy cream, vanilla extract, cinnamon, ginger, and nutmeg until smooth. Add pumpkin mixture to the cheese mixture, and beat until combined. Pour batter over cooled crust and spread evenly. Place the pan inside a large roasting pan, then pour enough boiling water into the roasting pan to come halfway up the sides. Place gently in the oven and bake for 60-70 minutes until the sides are set but the center is still slightly wobbly. Remove the cake pan carefully from the water bath, and place on a wire rack. Let the cake cool slightly, then run a knife around the sides of the pan. Let the cake cool completely. Cover the cake with plastic wrap and refrigerate overnight or for at least 12 hours. Cheesecake will keep in the refrigerator for up to 5 days.